This is Sekaichizu Kinoshita, whom Kotaku first introduced this past spring. 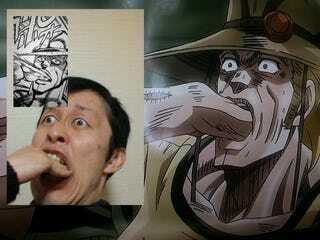 Kinoshita has been trying to make a name for himself as the guy who imitates the various twisty facial expressions found in Jojo's Bizarre Adventure. He's pretty good at it, too! Previously, Kinoshita was only comparing his expressions to the manga original, but this month, he's been tweeting photos with the anime versions, too. The result—manga, anime, and human—makes for a fascinating comparison. Below, you can see photos from Kinoshita's Twitter. Oh, it also seems he's been pulling off Jojo poses around Osaka. In front of the Tower of the Sun. At a recent Doraemon exhibit. For more anime hijinks, follow Kinoshita on Twitter.